In the early 1950’s Evangeline and John Bergstrom wanted to create a free, public museum for their community. In their will the Bergstroms left art collections and a blueprint, but opening the museum and sustaining it since 1959 has been the result of support from countless members in our immediate community and around the world. 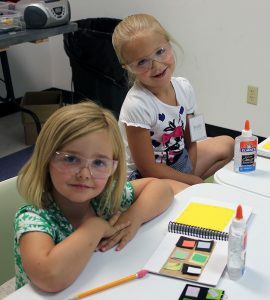 From stellar exhibits of contemporary masters to proud smiles on the faces of pint-sized art campers, our members, past and present, make the museum a reality. To continue to make this treasure accessible to everyone, we need you to join. Your investment in the museum provides meaningful benefits to the community, allowing the museum to offer free guided tours for school groups and art activity days where people of all ages can be creative together. To help you relax, entertain guests or simply learn something new, the museum offers classes, educational programs and social events throughout the year. Bergstrom-Mahler Museum of Glass is operated by a private foundation and is independent of the City of Neenah. We rely on private support to continue to serve you. When you join the museum, you are supporting the preservation of our collections, acquisition of new objects and educational programming for the enjoyment of everyone. Please consider joining today.